The swivel-based models EA 117 – the task chairs in the Aluminium Group by Charles and Ray Eames – add an iconic presence to prestigious office environments. 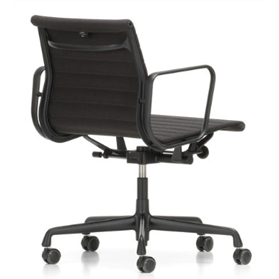 They are equipped with a tilt mechanism that can be adjusted to the weight of the user, providing for optimum comfort. With a broad selection of upholstery colours, it is easy to find the perfect chair for every office environment.